The neighbors on the same side of the house as Maddie’s bedroom have a dog. Maddie’s lived on that side of the house all her life, and that dog’s always been there. Luckily, she’d become accustomed to the sounds of the dog playing between the houses. But lately, that dog’s been getting on in years. And he’s developing a psychotic habit of barking a few minutes after I put Maddie to bed. The first night he did this, Maddie freaked. She just instantly burst into a torrent of tears and wails of terror. It actually took me a few minutes to figure out she was crying at the sound of the dog. A complication is that she doesn’t have a window in her bedroom to the neighbor’s house. So her room shakes with the barking of the crazy canine, but it’s not clear where the dog is in relation to her. It’s a bit unnerving. I couldn’t think of anything to say to console her, until an epiphany hit me. My little ruse worked. Ever since, when I put Maddie to bed, she’ll ask me, “Doggie go night-night? Doggie say ‘Goodnight moon? '” And I’ll answer, “Yes, Baby. The dog’s going to bark Goodnight Moon soon, and then he’ll go to sleep.” Maddie likes that, and curls up into a comfortable sleeping position for the night. During this first year of Aaron’s life, we’ve been learning little snippets of his language. We’re better at this with Aaron than we were with Maddie simply because he came second. (Sorry Maddie!) It’s easy enough to distinguish between certain cries and happy sounds, but we’re proud that we can tell when Aaron wants to play a certain game, and request certain particular things. Sputter: Lift me high and make me fly like an airplane. Grunt: I want to eat that. Recently something’s been happening that we thought was cute but pointless. Until today. Aaron was crying, and when Lillian discovered that his diaper overflowed, we both realized that we’d assumed the other one had been doing the changing. I dash him to the changing table and free his little privates from their damp and suffocating prison. Aaron smiles at me and holds one hand steady as he beats it with the other. Sorta clapping. No, not sorta clapping. Clapping. Aaron was expressing gratitude that I’m fixing the problem. He had learned how Maddie, Mommy and I all clap when we congratulate each other. Then I realized where we’d seen this before, sometimes when we’re doing it and he’s joining in, but also when he gets Cheerios. Oh! So, I was wrong in my last post. He doesn’t like any baby food anymore. He’s grown out of that. And he’s been trying to tell us — in our own language — that he’s been wanting Cheerios instead of baby food. It’s difficult to adequately describe to childfree people certain patterns of behavior of babies. It’s not that what they do is so adorable, or so annoying, but sometimes what they do is so nonsensical as to be unbelievable. Consider the way my babies eat. Maddie did this to some degree when she wasn’t quite one year old. But Aaron’s got this behavior down pat. He won’t consciously eat. That bears repeating with emphasis. What the hey, kiddo? Don’t you get hungry? Ever? Well, we’ve never been able to starve the kid for long enough to really see him actively eat. We always break first. We refuse to cause our kid to be malnourished. Offer Aaron food we know he enjoys. Watch him turn away, or maybe swat at the food like it’s poison. Chase his mouth with the spoon as he twists and turns his head. Try to settle the kid. Get his attention. Make the spoon fly around in a fun manner. Pretend it’s some vehicle delivering cargo. Watch him turn away at the slightest indication the cargo’s destination might be his mouth. Eat some baby food, pretend it’s good. Watch him be unaffected by the display. Find a toy or other bright or noise distraction. Get him interested in it. Pretend feeding time is over, and give him a few seconds with the distraction to ensure he’s really into the thing. Scoop some baby food, and deliver the baby food directly to his mouth. He’ll be engrossed in whatever he’s doing, but somehow, his peripheral senses indicate food is coming, and he’ll open his mouth to accept it, and gladly eat it. He’ll take his whole meal easily as long as he’s totally engrossed in something. As soon as the distraction loses effectiveness, and he becomes cognizant that he’s being fed, we’re back at step one. Addendum: There’s precious little that can hold an 11-month-old baby’s attention for more than a minute. Today we had leftovers for dinner. I was trying to feed Aaron some baby food, which he refused whole heartedly, while Lillian intermittently hand fed him tender pieces of chicken, which he gobbled up. It seems Aaron’s decided there’s no reason he should be eating different food from us, now that he’s got two whole teeth. She actually liked that idea, and took to it nicely. I went into the kitchen to help Lillian with the dishes. We were enjoying talking about videos and piracy when we both realized there was a problem: We didn’t have to speak above the din of the children. I dash to the dining room to find Aaron standing next to Maddie’s high chair, with his head tilted back and a big smile on his face with vermicelli cascading out of his mouth. Maddie’s got just as big a smile going as she gleefully scoops the vermicelli off her plate and into his eager mouth. Lillian grabs the camera and grabs this one shot three seconds before Aaron’s stomach realizes that this is a bit too much adult food, and half his dinner comes back up. So, indeed there was trouble. But it wasn’t because the boy conspired with the girl to thwart our potty-training efforts. It was because I took some bad advise. I’d been told by one individual how hard potty training had been going for her, because she was such a softie with her child. And I’d been told by another individual that the best way to potty train was in a full on all-or-nothing commitment, with rewards and negative reinforcement. We’d decided to try out the all-or-nothing tactic, complete with negative reinforcement for mistakes. I’d scheduled some time off from work, and watched Maddie with an eagle eye. We asked her if she wanted to go potty every 20 minutes or so, and praised her when she did, but when she had an accident, she was given a firm reprimand, even a swat or two on the bottom. She did indeed pick up on potty training quickly. But even if the negative reinforcement helped in that regard, it wasn’t worth it, and we’re not going to use it on our next child. There was a short period where Maddie really withdrew from her normal fun-loving self. She stopped eating, drinking and playing like she used to. And I’m talking about a couple of days. It’s hard for me to write objectively about this. Maddie’s change in behavior freaked us out, and I felt awful. I spent the next few days trying to undo the damage I’d done. And although she’s now a wonderful, happy little potty-trained girl, I still regret the path we took to get her here. 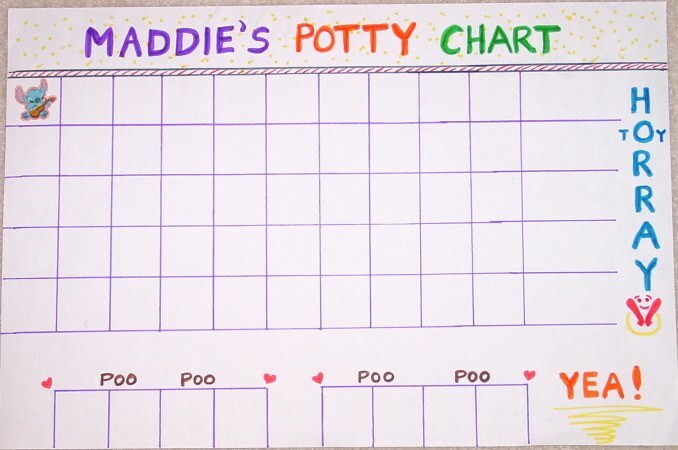 Here’s the best advise we got, regarding potty training: Create a chart with a few rows of 10 spaces or so. Get some stickers your child likes, and each time they successfully use the potty, allow them to put a sticker on a space in the chart. When a row is filled with stickers, the child gets a modest but special reward. Our hands have been forced by the Day Care. We have to try and potty train Maddie so we can get her into the classroom we prefer. I’ve taken next Monday and Tuesday off work, and today, Saturday, we begin potty training in earnest. We’re going to give it everything we’ve got. Maddie is being monitored around the clock. But so far, the potty trainers are meeting utter defeat. Progress is non-existent. That’s not so bad. I’ve given myself four days of around-the-clock Maddie watch. We will win, or die trying. Today, the boy, Aaron, made an advancement. Yesterday, the best he could do was this “paraplegic crawl.” He’d use his arms to drag his limp body and legs around. His arms were getting pretty strong, by the way. Sure he was getting around, but it was relatively slow, and we could hide dangerous items at waist height. Today, he’s mastered the opposing hand-knee crawl that normal babies do. We knew that was coming soon, so it’s no big deal. But then he lifts himself up to his feet at the couch, and starts pulling down remotes and things he’s not supposed to be getting into. The sucker learned to crawl efficiently and to cruise on his feet in one day. Tomorrow, he turns nine months old. This gives him the mobility and agility to force us to take our eyes off Maddie for a few precious seconds where she can run away do her business away from the toilet. It’s like a secret alliance between those two. Yesterday, Maddie got a Happy Meal from McDonald’s for being so good during her allergy test. She lucked out! She got the Kim figurine from the Kim Possible set, and she loved it. It’s got a section that lights up when you push a button. Today, after lunch, (which she barely touched, but that’s a different, and far more common story) she asked if she may be excused to go play with her toys, “Toy!” She’s very succinct. Maddie understands the rule we have about the family room. Before playing with your next toy, you need to clean up the previous toy. But this time, instead of going straight to the Kim figurine, she goes to one of the old toy boxes and drags it to the middle of the room. There she proceeds to tip the box over, and spill all of its contents onto the floor. Maddie’s Mom and I look at each other. Doesn’t Maddie know where she left the Kim toy? It’s not in that box. Maddie sorts through the toys for a moment, probably rediscovering some old favorites. Then she grabs the toy she was actually after: The box. She puts it on her head like a helmet, and peeps out of the handle slot like it’s the helmet’s visor. Then she proceeds to bobble and weave through the house with the box over her head like a drunken mini astronaut. Although I love the Monterey Bay Aquarium, I couldn’t work there. It makes my blood boil to watch empty-headed tourists take one flash photo after another straight into the aquarium glass, scaring the fish. Not only are the fish learning to avoid the glass, the tourists are getting nothing but photos of flashes reflected in the glass. Ugh. We took the family to the Monterey Bay Aquarium for Labor Day weekend. Although we’ve taken Maddie there before, we knew she’d get much more out of it on this trip. Before we left, we explained to her how we’d take her to see fish, turtles and otters. Before long, the anticipation began to take hold of her. She’d ask us if she’d see, “Fish?” “Yep,” I answer. “Birds! !” This will apparently be the highlight of the whole trip. Yep, whatever, Maddie. Like I have to drive you over an hour away to see birds. Anyway, we get there, and we take Maddie straight to the Outer Bay exhibit, where they have big sea turtles. She likes them. Then, we take her straight to see the sea otters. She likes that, too. This trip is going pretty good! Next, I take her to see the octopus exhibit. The big octopi are always hiding, and never moving. It’s actually a lot more rewarding to watch the cuttlefish. At least they do something. But this time, the Giant Octopus is resting in plain view, and it’s white, in stark contrast with the surroundings. What an opportunity! I lift Maddie up, and she identifies it immediately. I look for my wife for a split second, and when I look back, the octopus turned a deep red. Wow! I wonder what that means. Then the octopus lunges for Maddie! It grabs ahold of the glass right at Maddie’s face. Maddie gets a little nervous, so I back away from the glass. Then she starts wailing and reaching for the octopus! I bring her back to its tank, and she can’t get enough. Every time I said, “Ok, that’s enough. Bye bye octopus,” she’d start tearing up and asking for “more octopus!” I had to hold her there for the better part of half an hour, even though the octopus didn’t do much else. We never made it to the bird exhibit, and Maddie never noticed. Lillian and I were sitting on the kitchen floor torturing Aaron. He’d be sitting there, and he can’t get away, because he can’t crawl yet. But he does love to touch things and feel new textures. Except for one. There’s this sleek, velvety toy that we put in front of him. He touched it for all of two seconds before he decided he didn’t want anything to do with it. So naturally, we put it in his lap. He wiggled, and was able to kick and scoot the toy away from him. Well, we just loved that. So we’d put it back in his lap, or take his little hand in ours, and place it directly on the silky toy. He wouldn’t know what to do, and we got major laughs out of that. Maddie had had enough of this. She walks over, grabs the toy, and walks it back to the toy chest and puts the toy away. But we weren’t done yet. She looks at me, but doesn’t move. She acknowledges the gravity of the situation. She hesitates, but she doesn’t give in. She dashes for the toy chest, digs out the slippery toy, and runs it back to Aaron. Threat averted. Lillian and I look at each other, pleased with ourselves. Nothing better than fooling/torturing your offspring. We also know I’ll never be able to pull that one off again.